Thank you for asking me to join you here today to kick off this important gathering for the arts. As you can imagine, as President of PBS, with more than 350 member stations, I travel a lot for my job, and I speak to a lot of different groups. No matter who I’m speaking to, I always make it a point to talk about the importance of the arts for our communities and our country. I emphasize how important the arts are to our economy, generating over $135 billion in economic activity, and supporting over 4 million full time jobs. And I talk about how important the arts, and creativity more broadly, are to the future of our economy, ensuring that we remain on the cutting edge of innovation. But I don’t think these numbers come close to expressing the true value of the arts, or why it’s so important that we come together as an artistic community to advocate for more support of the arts. In each of the communities I’ve visited, I’ve seen great art, and I see the bigger impact it has on the community. I know from my own experience how enriching the arts can be. I cannot tell you how many times I’ve walked into a concert or a play – preoccupied with some issue at work or home – only to come away with a new perspective. The arts are what make us human. They feed our soul, inspire us, and stretch our sense of what’s possible. They break down barriers between people and cultures, and give us a chance to see the world from many different perspectives. In this time of so many divisions, when people seem intent on isolating themselves from everyone who might be just a little bit different from themselves, I can think of nothing more important than building bridges between different communities, and helping Americans recognize our common humanity. It is this power to bring people together – to break down barriers in language, geography, culture – and yes, even ideology, that I think is so important today. Beyond showing us the world through other’s eyes, participation in the arts measurably strengthens communities and promotes civic engagement. This is not just an empty claim. A study conducted by the Performing Arts Research Committee looked at the value of the performing arts in ten representative communities nationwide. More than seventy percent of the respondents strongly agreed that exposure to the performing arts helped them better understand other cultures and also agreed that seeing the performing arts live encouraged them to be more creative. The study also showed that people who attend arts events are much more likely to volunteer in their communities. This gets to the core of our work at PBS. In public broadcasting, our job, like yours, is to enrich people’s lives. Our 350 local stations have a long history of serving and engaging with their local communities, from their work in early childhood education, to their local programming which reflects the spirit and needs of their community. And we think there’s a special opportunity to build and serve our communities through the arts. Research from the NEA shows that people who engage with the arts on-air or online are 3 times more likely to attend a “live” event than non-media users. Television is a powerful medium, but public media is uniquely positioned to translate this power into real impacts in our communities because of our local/national model. Unlike commercial stations, our local stations are owned by the people they serve. We are committed to building relationships at the local level with you, to broadcast your work, and help you reach a wider audience. 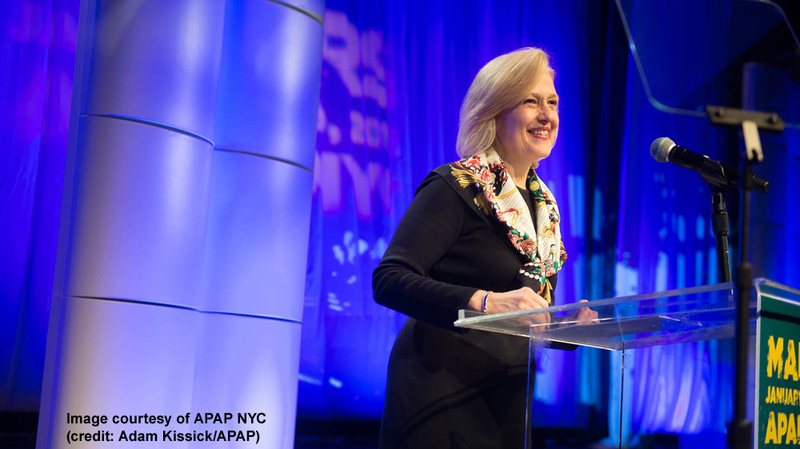 Since I became President of PBS, I have placed a strong emphasis on the importance of the arts, and I’m especially interested in how we can help promote access to the arts in communities all across the country. In public media our goal is to use the power of media to make the arts available to all. Everyone, regardless of their income or where they live, should have access to the great music, theatre, and dance that are the legacy of this country. At a time when funding for music and arts within our schools is being cut, PBS and member stations are helping to keep the arts alive today and for generations to come. By removing economic and geographic barriers, millions of people can experience the worlds of music, dance, theatre and performance, including opportunities that might not otherwise be available to them, through public broadcasting. During the 2014-’15 season, PBS offered nearly 600 hours of arts and cultural programming, seen by over 110 million people. We like to think that we are able to give people a front-row seat and a backstage pass to both the world’s greatest cultural experiences and invitation to meet intriguing new artists. Of course, we don’t do all of this alone. We need you, the artists and the presenters, to help us shine a spotlight on the great art that’s happening now. We need to strengthen our partnership, so that we can work together to bring more music and drama and performances to the people, because it’s clear that people are hungry for great art and artists. While some may look at the state of the arts in the US, and especially arts funding, and see reason for disappointment, I see a lot of reasons for hope. The National Endowment for the arts tracks participation in the arts. And while the overall participation in what they call “benchmark” activities like attending operas or jazz performances has fallen slightly in recent years, I see signs of a renaissance in the arts. Slightly over half of all American adults attended a live visual or performing arts activity in 2012, according to the latest data from the National Endowment for the Arts. And even more importantly, 71 percent of Americans used electronic media to watch or listen to art; and 44 percent created, practiced, performed, edited, or remixed art. New technologies and new platforms are giving us new ways to reach our audiences. And people are using these new technologies to engage in creative endeavors themselves. This is important because the arts will be our legacy. Civilizations are remembered by the art they have created. But, if this is to be a golden age for the arts, then we have a lot of work to do. We must help build new bridges between diverse communities, and offer new windows of opportunity for people to see the world through someone else’s eyes. We must open people up to the beauty of the world around them, and the possibilities that are at each of our fingertips. As artists and arts presenters, this is your task. But as part of this larger artistic community, you don’t have to do this alone. Let’s join together as partners, so that we can expand access to the arts. Let’s work together to celebrate the great art being created all across this country. And let us build new partnerships between arts organizations so that we can promote and sustain the arts. The stakes are too high for any of us to fight this battle alone. On behalf of all of us in public media, we look forward to working with you, to use the power of our platforms, to leave a bold signature on the walls of history, that this was a golden age for art and artistic expression.